London on a sunny day is one of my favourite places to be. Everyone’s mood is notched up a dozen points and the capital comes alive with summer vibes. From lidos to festivals to pub gardens, London is filled with beautiful ways to spend a day in the sun. One of my favourite options is to head to an outdoor cinema. 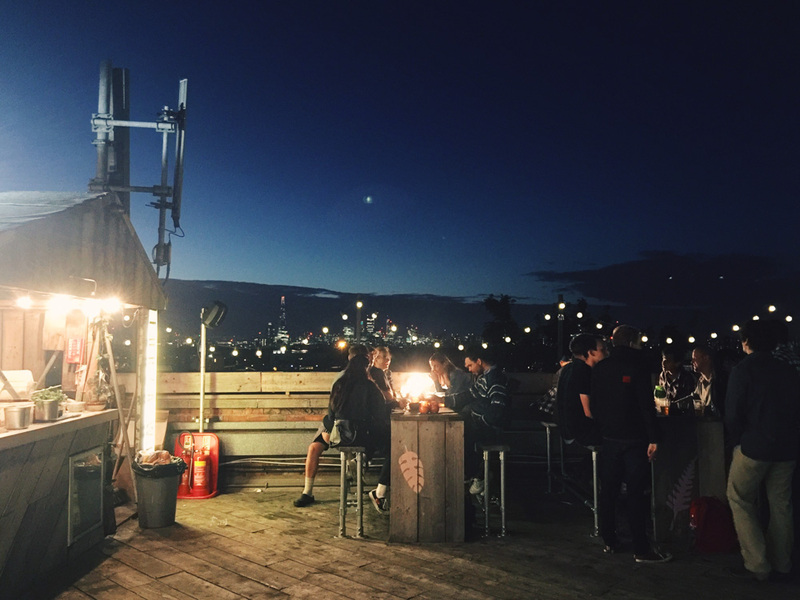 More and more are opening their doors across the city and, luckily for us, we have one right on our doorstep at the Rooftop Film Club on top of the Bussey Building in Peckham. Here’s a little film we made about it for Visit Britain’s #OMGB campaign. It was such a beautiful night. Isn’t the view amazing?! 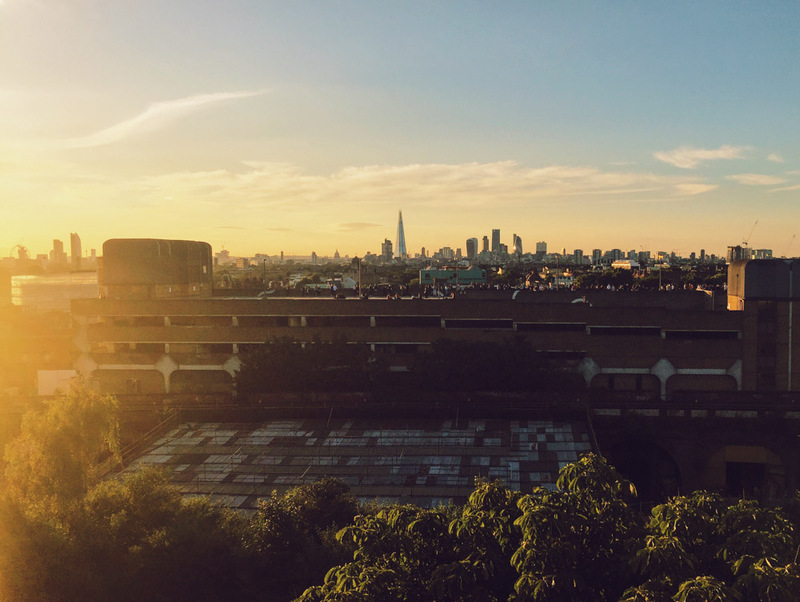 It was in 2008 that I first saw this view when Frank’s bar opened on top of a multi-storey car park just beside the Bussey Building. Back in those days, many people still considered Peckham a bit of no-go area, so Frank’s was a true hidden gem that we felt lucky to live so close to. By the time I returned from travelling in 2014, Peckham had established itself on the hipster map and the popularity of Frank’s was off the scale. In the meantime, the Bussey Building had also become an emblem of Peckham’s creativity. It began in 2007 when a creative arts project, Chronic Love Foundation (CLF), was tasked with putting the building on the map as a creative hub, all as part of a campaign to save it from becoming a tram depot. Its club nights become legendary, and after three years of events and exhibitions, TFL’s planning permission was withdrawn and the Bussey Building not only became an arts centre, but also part of the Peckham conservation area, protected permanently from destruction. 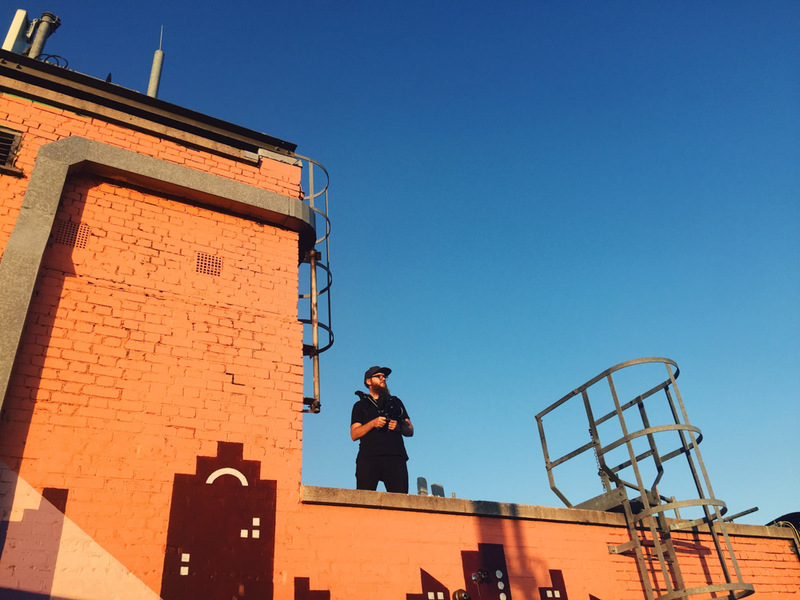 It, and the surrounding Copeland Yard, is one of the most interesting and impressive places in Peckham, filled with artist studios, co-working spaces, bars, music venues, theatre groups, restaurants, yoga studios, and faith groups. I go there for yoga classes at Yoga Rise, meals at Forza Win, cocktails at The Nines, and some of the best tacos I’ve ever tasted in Taco Queen at Rye Wax. 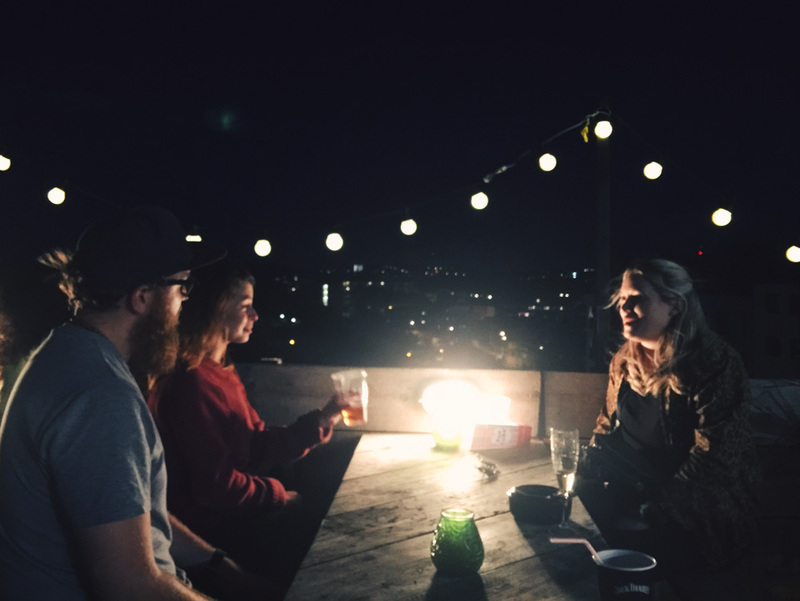 It’s on top of this impressive building that you can find the Rooftop Film Club as well as a brilliant rooftop bar. It has the same panoramic view as Franks, but is in a more intimate setting. It even has an old-school Photo Booth you can use for free. Each year, the bar hosts different food stalls, with this year seeing Forza Win cook Italian-style street food, and Spirited Mixers serve up fresh cocktails and liquor desserts. It’s ideal for a pre-cinema snack, or to take with you to the film. And the cinema sells more popcorn and treats. Everyone who enters the cinema for the first time lets out a little gasp. The big screen, backed by London’s skyline is one of, if not the, most impressive cinema settings in London. 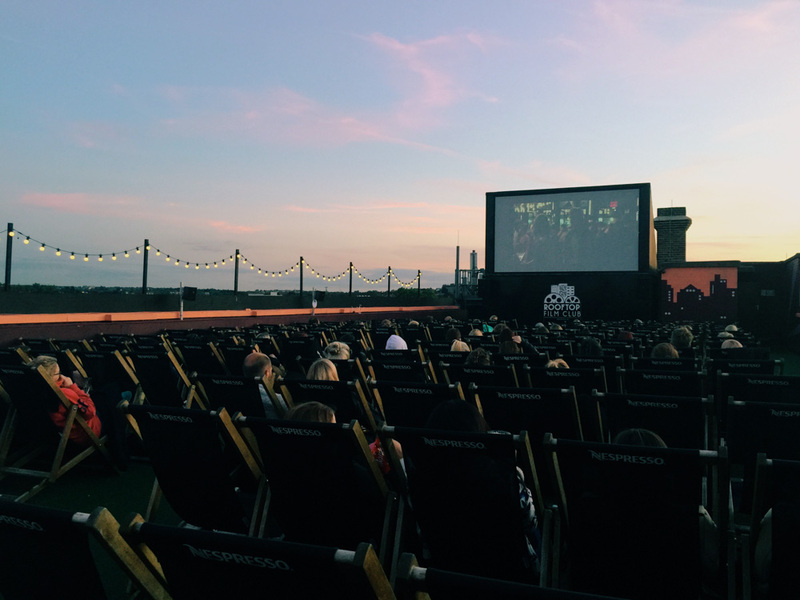 Guests sit in deckchairs to watch the film with wireless headphones and cosy blankets if needs be. It’s a perfect way to spend a summer night. 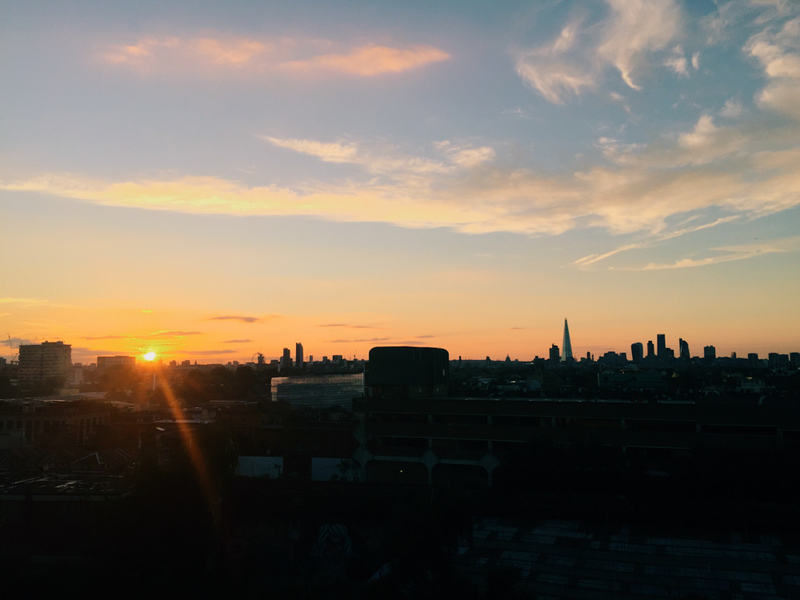 Watch the video for a little taster of what the Bussey Building Rooftop Film Club is like, and be sure to visit yourself next time you’re in London. 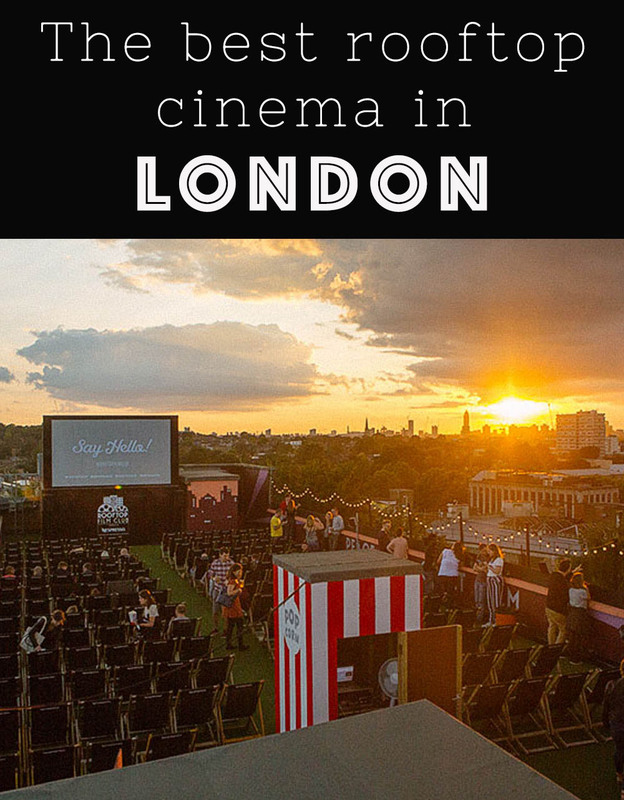 The Bussey Building cinema is one of five Rooftop Film Clubs in London, and they also have cinemas in New York and Los Angeles. All screen classic, cult and recent releases over the summer months, varying from just a few showings to a full six-day-a-week schedule. The one in Peckham shows films every night aside from Monday from May through to September. The other London locations are: The Queen of Hoxton in Shoreditch; Tobacco Dock in Shadwell; Roff Gardens in Kensington; and Roof East in Stratford. 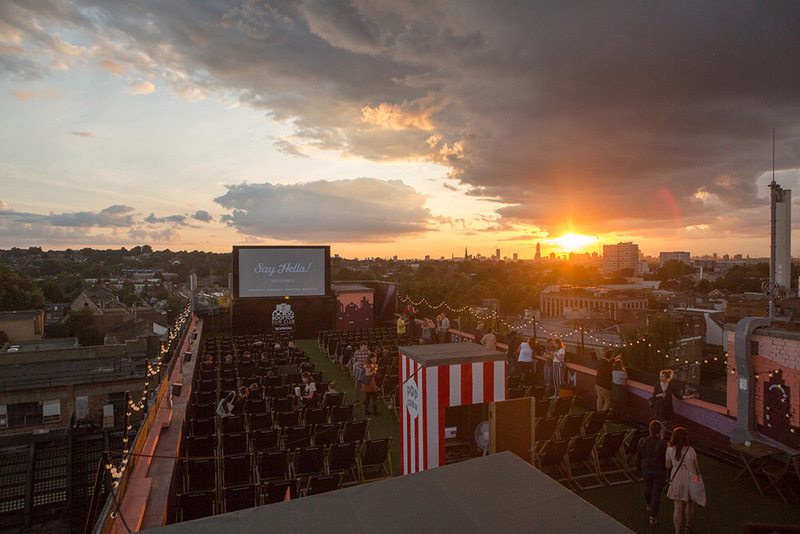 See the full cinema schedule for the Bussey Building Rooftop Film Club here. 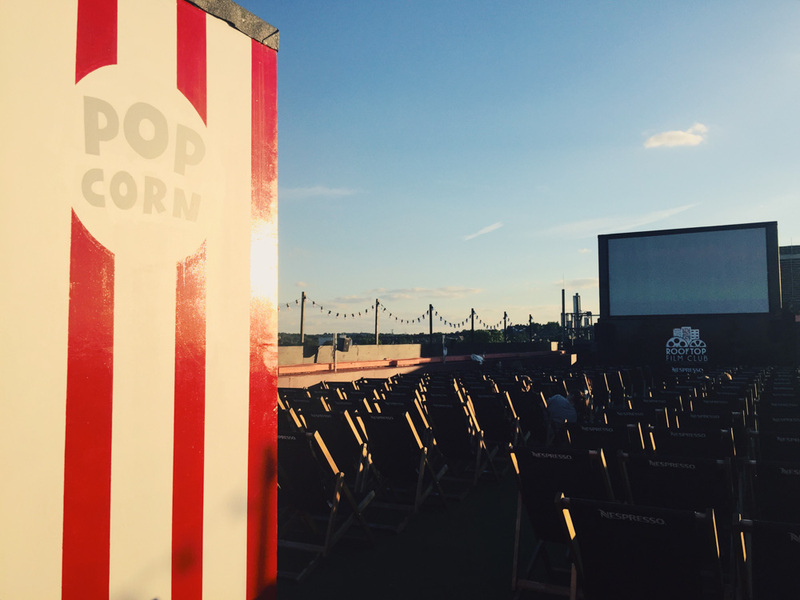 The roof and bar open at 5pm and screenings start at sunset (check your ticket for the exact time). We made this video for Visit Britain’s #OMGB campaign. All opinions, as always, are my own. I love Peckham.